Description: Our gothic princess is in need of a new haircut. Will you help her? You can go for a short or long hairstyle, dye it in any color you like and straighten or curl it. 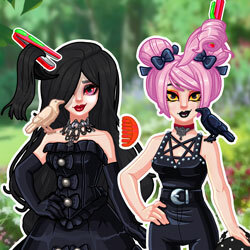 After that, choose the perfect outfit, apply some makeup and find a pet for our favorite gothic princess.